UPDATE: July 25 -- Robert Phillips, Harrell's lawyer, confirmed Friday that Harrell was never fired. He wrote in an email that McDonald's told him and his client that she was never fired and the incident was just a "misunderstanding." Phillips said Harrell's manager spoke to her and put her back on the working schedule. "I don’t know exactly what happened, but if they say it was only a misunderstanding and Ms. Harrell is back working now, we are happy to accept it was just a misunderstanding," he wrote. Debra Harrell, the South Carolina woman who was arrested after her 9-year-old daughter was found playing alone outside while she was at work, has been fired from her job at McDonald's, her lawyer said on Tuesday. "She is currently unemployed,” Harrell’s attorney Robert Phillips told The Huffington Post, adding that he didn't know why she was let go from her job. But in an emailed statement to HuffPost, McDonald's spokeswoman Lisa McComb said Harrell has not been fired. "It would not be appropriate to discuss an employment matter in the media, but I can confirm that this employee has not been terminated," McComb wrote on behalf of the owner of the McDonald's location where Harrell worked. 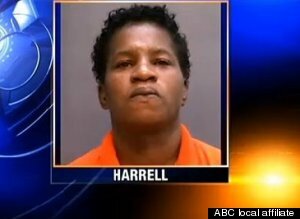 Harrell's mugshot from earlier this month. Harrell was arrested earlier this month after her daughter told a witness at a playground that she was there unsupervised while her mom was working at a nearby McDonald’s. Harrell was charged with unlawful neglect of a child, a felony. Her arrest stoked controversy, with local news coverage portraying Harrell as a neglectful mother and a variety of news outlets and blogs suggesting her arrest was unwarranted. Though Harrell’s situation may seem extreme, the high cost of child care, combined with a proliferation of low-wage jobs in recent years, has pushed many parents to desperate lengths to balance their kids’ needs with having a job. A growing number of women are staying at home because they can’t find a job that covers the cost of child care. Others who are are employed are forking over a sizable portion of their paycheck to cover child-care costs. It’s also likely that many are making the same choice as Harris. More than 8 percent of 9-to-11-year-olds and 27 percent of 12-to-14-year-olds are left unsupervised for some period of time, according to a Census report from 2011, the most recent data on the topic. It’s possible the numbers could be even higher, given that parents could be hesitant to discuss the topic honestly. Have you struggled to find childcare and left your child unsupervised while at work? We'd like to hear from you. Email jillian.berman@huffingtonpost.com.